Petaling Jaya – How many of your natural teeth would you still retain when you reach 60 years old? Or 80? Have you ever wondered how life would be like if you do not have adequately functional teeth? Imagine starting off your day with very limited choices in what you could eat. Your exposed gums are also at risk of infections and diseases going into your body. According to World Health Organization (‘WHO’) Fact sheet N°318, poor oral hygiene is a risk factor to oral disease and oral diseases are often linked to chronic diseases such as cardiovascular diseases, cancer, chronic respiratory diseases and diabetes. Due to these additional health complications, people without teeth may live shorter lives than those with a full set of teeth. Besides the health and dietary complications, people who do not have teeth or have poor dental care are usually less confident than those who do. Speaking would be a big challenge without teeth. Imagine not being able to smile due to the embarrassment of your missing teeth or not being able to speak clearly due to the gaps from the loss of teeth. 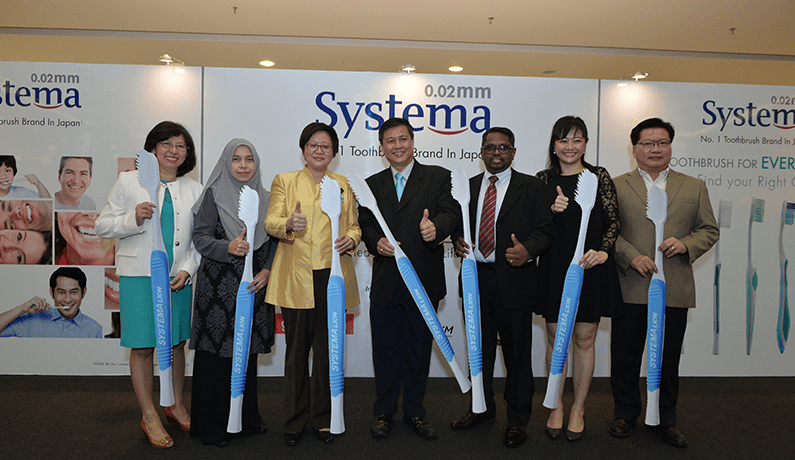 SYSTEMA the number 1 selling toothbrush in Japan, in partnership with the Department of Social Welfare (‘JKM’) which is an agency under the jurisdiction of the Ministry of Women, Family & Community Development (‘KPWKM’) and the Malaysian Private Dental Practitioners’ Association kicked off the “Start Right Brush Right. Healthy Teeth For Life” campaign. The campaign which coincided with the celebration of World Oral Health month was officially launched by the Deputy Minister of Women, Family & Community Development, Yang Berhormat Senator Datin Paduka Chew Mei Fun. The “Start Right Brush Right. Healthy Teeth For Life” campaign is aimed to encourage Malaysians to maintain at least 20 teeth even when they reach 80 years old by cultivating better oral care habits as part of their daily routine from young. The campaign targets at providing Malaysians with accurate information and knowledge about oral hygiene. 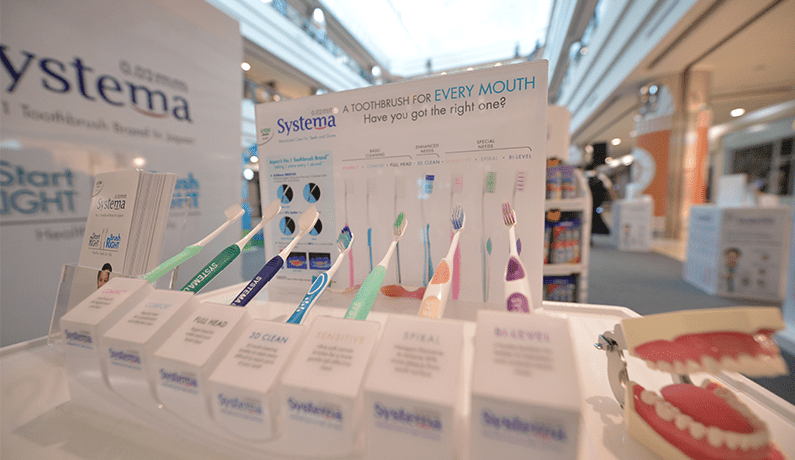 SYSTEMA believes that good oral hygiene begins with 2 simple steps, which are to choose the right toothbrush as well as to start adopting the right brushing techniques and habits recommended by dental professionals. “For healthy teeth and gums, a toothbrush is the most important tool; it must be able to clean beyond just tooth surfaces but effectively all parts of the teeth especially the difficult to reach gum lines, back teeth and between teeth, yet is gentle on the gums and teeth. 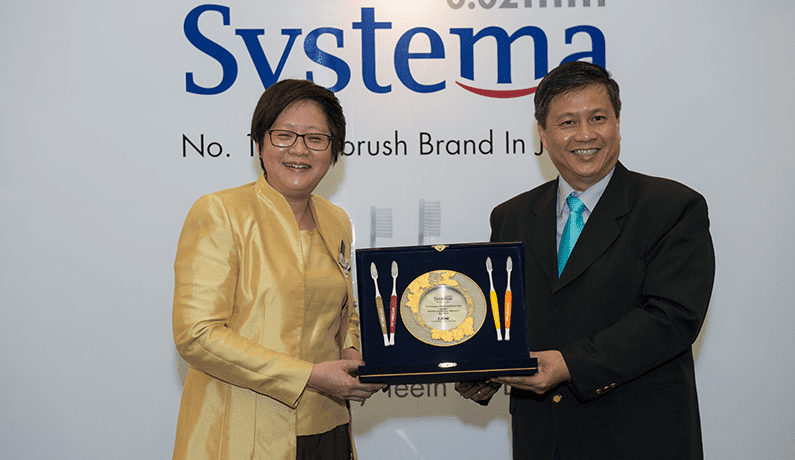 With the patented 0.02mm tapered bristles from SYSTEMA, tackling the tough brushing challenge of reaching every part of our teeth to remove plaque and food debris can be done in an efficient and comfortable way,” said Christina Yong the Marketing Director of Southern Lion. The SYSTEMA “Start Right Brush Right. Healthy Teeth For Life” campaign kicks off with a roadshow in partnership with Guardian Pharmacy at Centre Court, 1 Utama Shopping Centre from 22nd to 27th March. The six-day event is to educate and share the importance of good oral care practice which starts from the basics of knowing the right way to brush our teeth and using the correct toothbrush. There will also be other on-ground activities and promotions in line with this campaign held at key retail outlets nationwide. 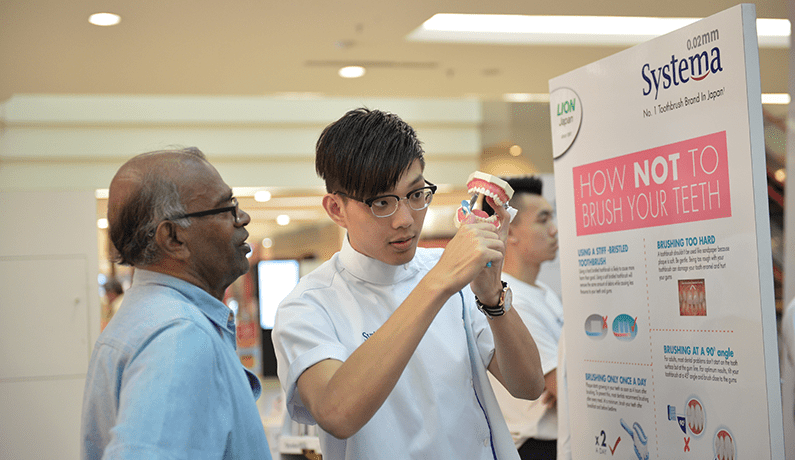 At the campaign roadshow, friendly dental officers will be conducting free oral checks for the general public using the intraoral dental camera technology. Using this method of tooth checking will enable the public to see for themselves the condition of their teeth and this will help them realise the need to start caring for their teeth. This method will also help reduce the fear of the dental chair that some may have due to past experiences. 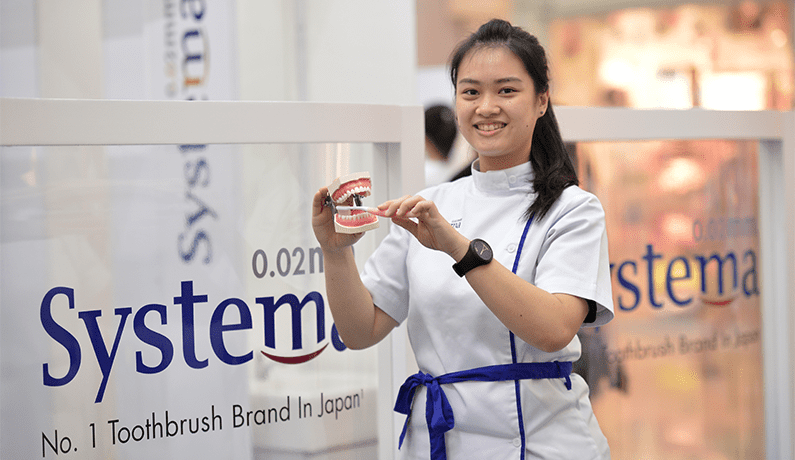 The SYSTEMA team will also be teaching the public the right brushing technique and will also guide the public on the selection of toothbrush in accordance to their brushing habits as well as their mouth size. Children are not left out from this campaign as there are also activities for them at the KODOMO section. They will be taught oral care through story telling sessions, song & dance and also educational games to help them understand the importance of oral care in the most fun and playful way. There will also be colouring contests to further excite the kids. 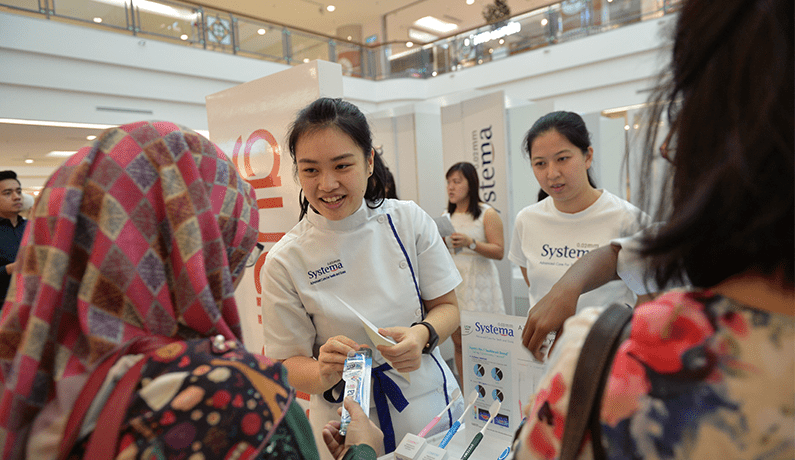 In the spirit of helping more Malaysians to achieve healthy teeth and mouths, SYSTEMA took the opportunity to pledge 10,000 toothbrush dental kits to be contributed to the Ministry of Women, Family & Community Development for the Kembara Kebajikan 1 Malaysia in further encouraging good oral health care amongst Malaysians. Now, achieving healthy teeth and gum is easy with SYSTEMA. Good oral care practice does more than just protect your mouth; it is also a great start to a healthy life. Start right, brush right to achieve healthy teeth for life!